The 1st stage is the voltage gain followed by the 2nd stage driver. We are now using Teflon capacitors for the signal transfer. Operate in class "A1" single ended. Self-biased...no adjustments (tweeks can swap valves without consequence) < ZERO FEEDBACK > No LOCAL or GLOBAL FEEDBACK of any kind! 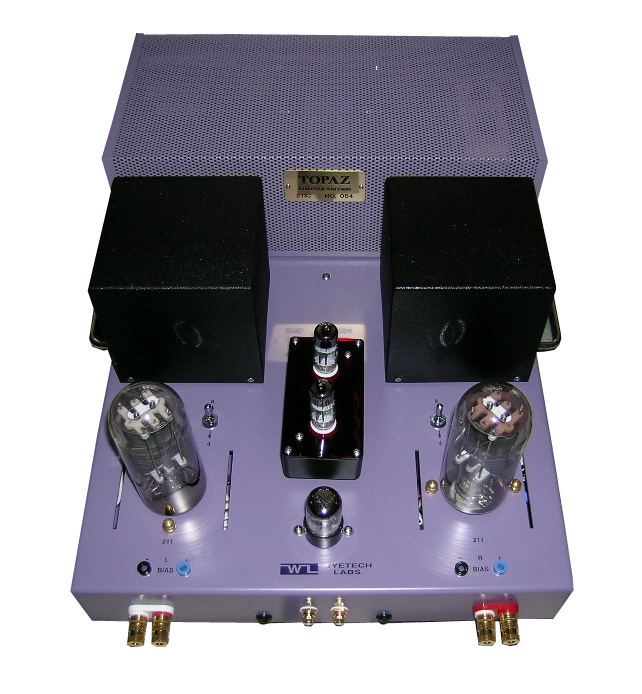 Dual output winding toroidal power transformer for 211 filaments is full wave rectified and DC filtered separately for each channel providing superior performance without the need for elaborate test equipment to balance out AC ripple and modulation effects which normally occurs when using AC current! 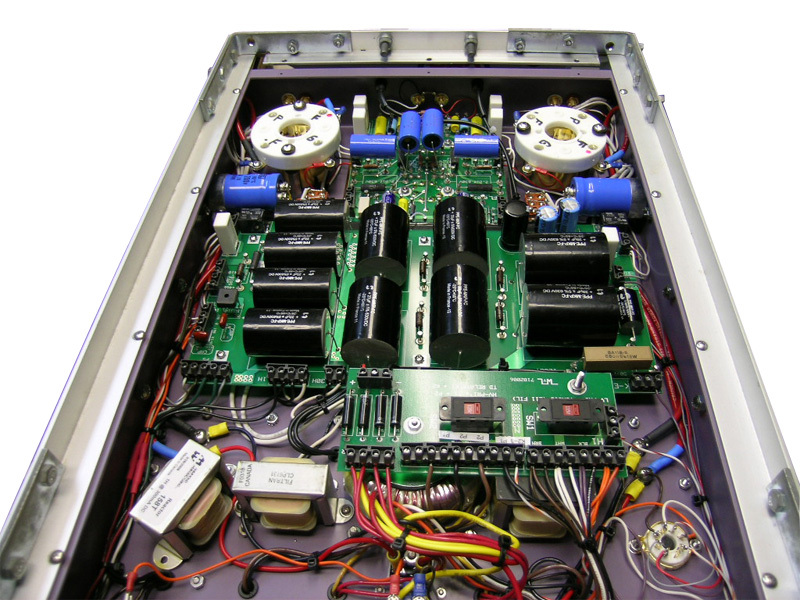 Separate power transformers and filters provide total isolation between the INPUT and OUTPUT stages. The INPUT High Voltage power supply (+450V) uses a TRIPLE Π L.C. filter network to obtain complete immunity from power supply induced signal aberrations. The 1st stage is further isolated from the 2nd stage using an RC filter network. 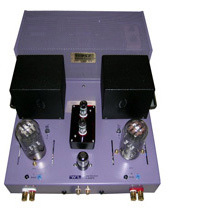 Two power transformers are used in the output power supply to further reduce mechanical vibration. The OUTPUT High Voltage power supply (+1200V) uses a current surge limiter and a dual full wave rectifier configuration feeding a TRIPLE Π L.C. filter network for excellent regulation as well as superb ripple and noise rejection! 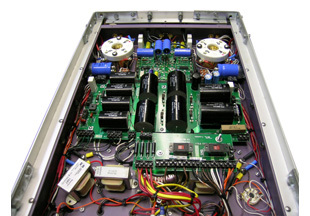 Seven large chokes and ten large polypropylene capacitors are used in the two high voltage power supplies which makes this a " PURIST POWER SOURCE " of the highest caliber! Extremely rugged (12 gauge) all welded steel chassis was implemented to further reduce any possibility of vibration induced signal aberrations. Very high quality pearl enamel baked on finish to further enhance the artistry. Rugged solid brass handles with nickel finish are implemented for ease of handling. A fine mesh screen covers the high voltage transformers and chokes. Tubes are left uncovered to enhance the visual arts. Some of the components are mounted on double turret terminal post, especially the power resistors, which improve the heat flow. These boards are then held elevated from the surrounding metal chassis to avoid any capacitive coupling between components. The double turret terminal post are first swaged to the printed circuit board and soldered into place. After that the boards are then hand assembled with parts soldered to these terminal post using silver based solder. For wiring to and from the boards Weco screw down terminal connectors are used to make connections between the various components and to facilitate easier replacement of parts for future reparability and long service life. This technique will result in much faster trouble shooting and repair in the event of any failure requiring servicing. Three time-delay relays provide proper power sequencing for stabilized circuitry before use and to provide extended tube life. STANDBY SEQUENCE 1: Allows filaments to reach operating temperature before applying high voltage. Can also be invoked manually via the POWER SWITCH. POWER SEQUENCE 4; A few seconds later the auto-mute is disengaged completing the turn-on sequence. last updated: 26-Aug-2012	| © 1996-2005 Wyetech Labs. All rights reserved.